Japan's election had a small number of female candidates, despite Prime Minister Shinzo Abe's goal to empower women. In Japan's recent snap election, one factor stuck out to some: a lack of female candidates. Of the nearly 1,200 candidates who ran for seats in the lower house of Japan's Parliament, fewer than one in five were women. As the last of the results are reported, only 47 of those candidates won seats in the House of Representatives (at time of writing, five seats were still pending). In the upper chamber, the House of Councilors, less than one-quarter of the seats are held by women. Before the election, Japan was ranked 165th out of 193 countries by number of women in its national legislature. The U.S. was ranked 101st, with roughly 20 percent female representation in Congress for all 50 states: 84 women serve in the House of Representatives, and 21 serve in the Senate. Five more women serve as representatives of U.S. territories and the District of Columbia. 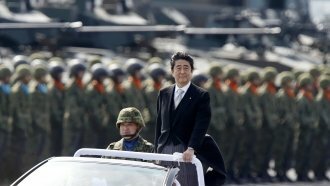 And despite the efforts of Japan's largest party in power to prioritize women, they made up only about 8 percent of the candidates for Prime Minister Shinzo Abe's Liberal Democrats in Sunday's snap election. Abe's economic policies — dubbed "Abenomics" — include a goal of of getting more women involved in Japan's labor force, which is shrinking as the country's population gets older. Looking ahead to November, Japan is preparing for its annual World Assembly for Women. Presidential adviser Ivanka Trump is expected to attend; she'll likely travel with President Donald Trump, who's scheduled to visit the island nation early next month.